courtesy PaperChef. Many of us use parchment paper to line baking sheets. But if you haven’t yet used that parchment for en papillote cooking, you’re in for a treat: less mess and fewer calories, for starters, along with juicier, moister food. Cooking en papillote (pah-pee-YOHT), French for “in parchment,” is a classic technique where food, often in individual portions, is enclosed in a folded pouch and steamed in the oven. This simple yet refined culinary tradition works by trapping the moisture from the food in the pouch. It helps the food cook quickly, with little or no added fat, without losing flavor and retaining luscious aromas. And there’s no pot or pan to clean. Just dispose of the pouch. The technique dates to the early days of cooking food, where people took local foliage—banana leaves, corn husks and grape leaves, for example—and wrapped food in them prior to placing them on the fire. The leaves/husks took the place of pots and pans. These days in the U.S., aluminum foil and parchment paper are the wrappings of choice, and the food is placed in the oven (or microwave) along with herbs and/or other seasonings. No special equipment is required. Poultry, seafood and vegetables are popular foods for en papillote cooking. You’ll immediately discover the joy of infusion. Topping a piece of fish with a slice of lemon or fresh herbs infuses the protein with those flavors. You’ll have fun playing with the flavors of broths, herbs, juices and spices. Steaming en papillote (pah-pee-YOHT) requires no special equipment, just the food and a roll of parchment paper or aluminum foil. Parchment can be used with any food, but is especially important when steaming foods with a salt rub or acid (citrus juice, vinegar). Anything but the lightest touch of the latter can cause discoloration or a chemical aroma from reaction with aluminum. Another benefit of parchment is environmental: it decomposes easily in landfill. Why doesn’t the paper bag or folded pocket leak? Parchment baking paper has been treated with an acid and coated with silicone. The result is a liquid-proof, burn-resistant paper (the parchment will brown but not burn, up to 450°F). It’s also nonstick; hence, its popular use as a baking sheet and cake pan liner. You can buy parchment in rolls, bags and individually-cut sheets. Rolls provide the most flexibility for baking sheets as well as pockets. What about bleached versus unbleached parchment paper? Environmentalists go for unbleached parchment. It’s more expensive, but also more environmentally friendly. Bleached parchment uses not only chlorine, but typically employs both chlorine and Quilon®, a cheaper alternative to silicone. Quilon is a chemical solution that contains chrome, a heavy metal. When incinerated it becomes toxic and leaves trace elements. It is approved by the FDA and the USDA, but that doesn’t mean it’s environmentally friendly. 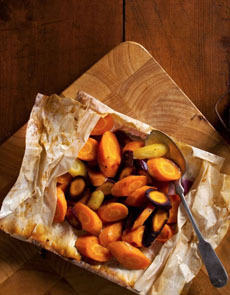 If you have leisure time this weekend, get some parchment and cook en papillote. 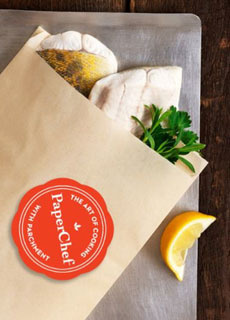 You can start with these videos from PaperChef.com, which also has plenty of recipes. No more need to fold pouches: Just add the ingredients to parchment bags. Photo courtesy PaperChef.